Maine is a state of small businesses. We are pleased to support our Maine friends by using Maine made ingredients in our freshly prepared gourmet breakfasts. We take the “Breakfast” in Bed and Breakfast very seriously here at the 1802 House. We prepare a three course breakfast each morning, and we do try to make something a little unique and unusual for our guests. When you’re visiting Maine, there’s a lot of good food to be had at our many great restaurants, so we want to make sure our breakfasts don’t disappoint! Roger and I are just coming up on our four year anniversary of buying the Inn and moving to Kennebunkport. We really enjoy living here and wanted to make sure from the very start that we supported our local community and this great state as small business owners. The first Maine made thing we found were Black Dinah Chocolatiers handcrafted truffles. At the time, Kate and Steve were producing these from their house on the little Isle of Haute in northern Maine. We buy boxes of these chocolates to have in the room for our repeat guests or to give as a gift for guests who are celebrating special occasions. In the time that we’ve known them, we’ve seen this wonderful little entrepreneurial business grow and thrive too which is great! So once the chocolates were taken care of, we turned our attention to breakfast. The first thing we did was scout around for coffee. Of course, you can’t grow coffee beans in Maine so no chance of going local for that. However, there are a number of places around the state that roast their beans on their premises. We found Katahdin Specialty Coffee and started serving their Breakfast Blend and Decaf Breakfast Blend to rave reviews from the guests. Still a firm favorite and always on offer at our breakfast table. 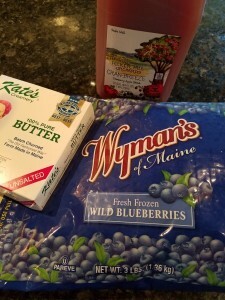 Another guest favorite is the Cran-Breeze juice we buy from Ricker Hill Orchards in Turner, Maine. This juice is their own fresh pressed apple cider mixed with cranberry juice from their own cranberries. It’s a great way to start your day! We have the Patten Berry Farm just down the road from us. This locally owned farm shop is a wonderful source of our fresh produce all through the summer months. We don’t know what kind of strawberries they grow, but they are so red they are almost purple and the sweetest, loveliest strawberries we have ever eaten. Later in the season the Wild Maine Blueberries come into the shop along with fresh picked raspberries and succulent blackberries. Delicious! The summer tomatoes close out the season and they offer the Big Boy or a choice of heirloom tomatoes. You can tell that these are fresh off the vine as soon as you taste them. We even buy Maine potatoes from them. 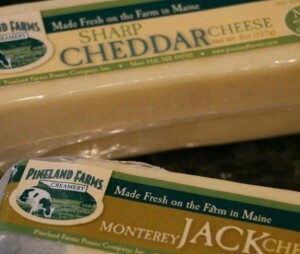 We are fortunate that we have several food suppliers who also favor the Maine Made producers. So when the farm shop closes for the season, we can source local products all year long. Cheeses, eggs and bacon are all from local growers. Some of the produce comes from farms and orchards that are miles away, others from just around the corner. We love Kate’s butter and they are just a few miles away from us. It’s nice to eat butter made fresh on the farm from cows that you actually see grazing in the fields when you drive by. We are so happy to have such a wonderful source of local ingredients nearby. Breakfasts definitely taste better – we hope you’ll visit and try it out for yourself when you are next in Kennebunkport.